Last week I posted about my grandma's death, I told you about how one of my fondest memories as a kid was going through JC Penny's catalogs and marking the presents I wanted. One of thing I never marked was clothing—except for something Steelers' related. From this post on clothing in a 1977 JC Penny catalog I think you can see why I never marked any clothing. I must confess though, I had closet full of clothing that looked like the outfit below. 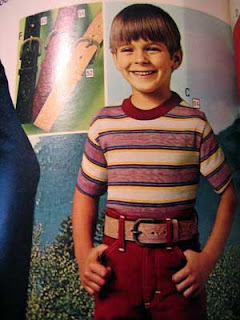 I even had a belt that had double notches—it barely fit through my belt loops on my Sears Toughskins.